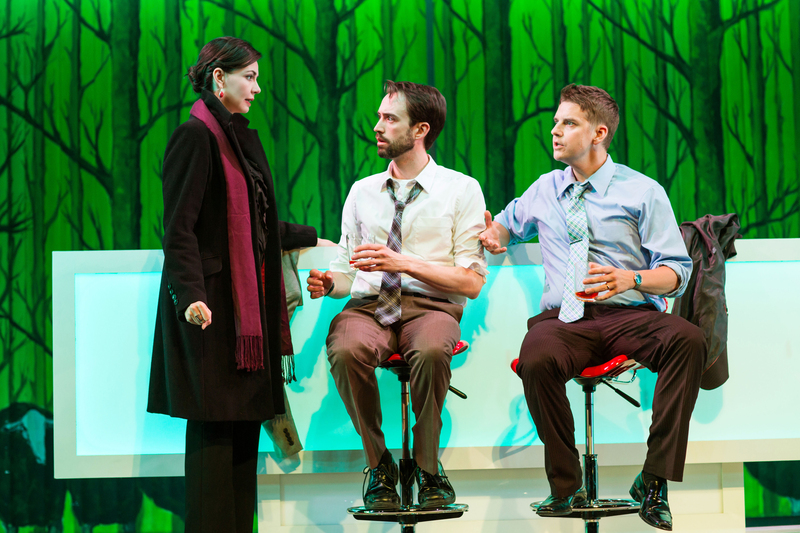 L to R: Liz Sklar, Kyle Cameron, and Patrick Russell in SF Playhouse’s world premiere production of Richard Dresser’s “Trouble Cometh.” Photo Credit: Jessica Palopoli. Richard Dresser is a slick and prolific playwright and TV writer. He knows from writing comedy and constructing plots. He knows about the corporate world of Hollywood, and he knows theatre. All of this shows to good effect in “Trouble Cometh,” a smoothly constructed comedy machine given a suitably slick production by a crackerjack team at SF Playhouse. The smooth professionalism on display here is a pleasure to enjoy, from May Adrales’s light handed, balanced direction to Nina Ball’s sharply observed set, to the performances of the actors, especially a very funny Kyle Cameron as the confused newcomer Joe, bounced around like a comic basketball by his boss, his fiance, and the executive assistant he wants to seduce. He makes his San Francisco debut in this production; here’s hoping he leaves his heart and has to come back again and again. Joe is the new hire for Dennis, a senior writer for a TV production company, charged with creating the pitch for a new reality TV show. Dennis, to put it mildly, is a piece of work — a bully, a liar, a player, and likeable in spite of it all. Joe and Dennis work with the very capable, seductive, and extremely practical executive assistant, Kelly, a woman who is not afraid to eavesdrop for her bosses, and who prefers to sleep with the married Dennis because, as a married man, he demonstrates that he is capable of stability and commitment. She tells Joe that she might consider sleeping with him, too, if he would demonstrate similar qualities. With jokes like that delivered by this highly capable cast in this highly polished production, the laughs are sure. It all goes down with the ease and delight of a successful TV sitcom. There are some plot complications suggesting the uncertainty of life, the ways we manipulate one another, and similar serious matters. To be honest, they didn’t engage me very much. I mostly enjoyed the laughs. If you’re looking for bigger fish to fry, cast your net elsewhere. For a guaranteed good time, this’ll do nicely. ‘Trouble Cometh’ plays at SF Playhouse through June 27th. For further information click here. “Trouble Cometh” by Richard Dresser, world premiere produced by SF Playhouse. Director: May Adrales. Set Design: Nina Ball. Sound Design: Theodore J. H. Huylsker. Lighting Design: Seth Reiser. Costume Design: Tatjana Genser. Props Design: Jacquelyn Scott. Joe: Kyle Cameron. Susan: Marissa Keltie. Dennis: Patrick Russell. Vashti: Nandita Shenoy. Kelly: Liz Sklar. Posted in Reviews.Tagged Charles Kruger, Kyle Cameron, Liz Sklar, May Adrales, Nina Ball, Patrick Russell, Richard Dresser, San Francisco Theatre Reviews, SF Playhouse, theatrestorm, Trouble Cometh.